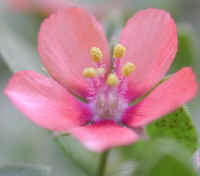 (Scarlet Pimpernel (Anagallis avensis) - 01) The scarlet pimpernel flower is only about 1/4 inch in diameter; thus it's quite hard to see the intricate detail without some magnification. 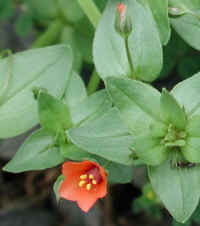 The scarlet pimpernel, a native of Europe, blooms from May to September. It is a member of the primrose family. 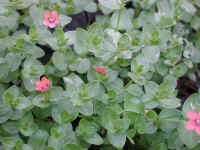 (Scarlet Pimpernel (Anagallis avensis) - 02) The scarlet pimpernel is a low-growing, trailing ground cover. 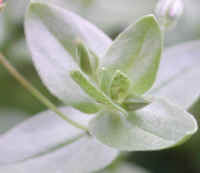 In this photo we can see the leaf structure, buds, and an opening flower. Our thanks to Brenda Nolen, Gene Cross, Rebecca Wilkowski, and Betty B. for identifying this wildflower. (Scarlet Pimpernel (Anagallis avensis) - 02a) The scarlet pimpernel foliage is composed of small, acuminate (sharp pointed tip), sessile (without petioles), glabrous (without hairs), and oppositely arranged leaves along the stem, with one pair of leaves perpendicular to the previous and/or next pair. 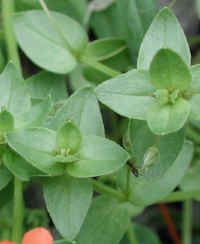 The leaves are relatively thick with a central rib which is often depressed, particularly in the newer leaves. 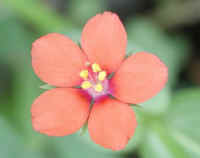 (Scarlet Pimpernel (Anagallis avensis) - 03) The showy scarlet pimpernel has 5 petals that can vary in color from orange to salmon. The base of each petal changes to a blue or purple color. 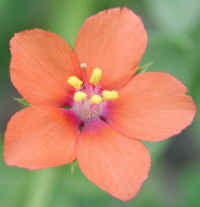 The scarlet pimpernel has 5 stamens and 1 pistil. Also note the tips of the bracts between each petal. (Scarlet Pimpernel (Anagallis avensis) - 04) We have noticed a spotting on the underside of the scarlet pimpernel leaves. (Scarlet Pimpernel (Anagallis avensis) - 05) This is another close up look at the scarlet pimpernel foliage. A flower stem is growing from a lower leaf axil. 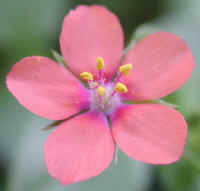 (Scarlet Pimpernel (Anagallis avensis) - 06) This is another close up look at the 1/4 inch scarlet pimpernel flower. (Scarlet Pimpernel (Anagallis avensis) - 06a) In this bee's eye view of the center of a scarlet pimpernel flower, we can see the the filaments of the stamens are hairy. 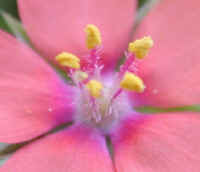 When we consider the amount of detail that God designed into this tiny (1/4 inch) flower, it is awe inspiring. (Scarlet Pimpernel (Anagallis avensis) - 07) This patch of scarlet pimpernel is growing as a beautiful low ground cover on the shore of Sleepy Hollow Lake. 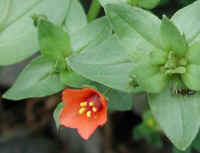 (Scarlet Pimpernel (Anagallis avensis) - 08) This is a semi-side-view of a scarlet pimpernel flower. (Scarlet Pimpernel (Anagallis avensis) - 09) To give some idea of the scale of this patch of scarlet pimpernel, remember that the flowers are only 1/4 inch across.